TOKYO (March 1): The dollar ticked higher on Wednesday as a handful of Federal Reserve policymakers boosted expectations for a March U.S. interest rate increase, just hours ahead of long-awaited speech by U.S. President Donald Trump. The greenback rose 0.3 percent to 113.16 yen while the euro dropped 0.1 percent against the dollar to $1.0565 . 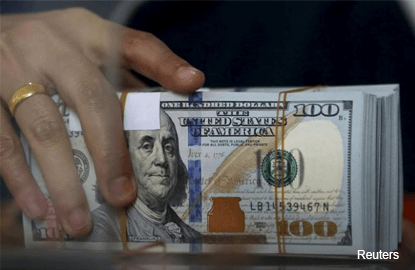 The dollar index, which measures the greenback against a basket of six major peers was last up 0.1 percent at 101.48. John Williams, President of the San Francisco Fed, said that a rate increase is very much on the table for serious consideration at March meeting given the economy at full employment and accelerating inflation. Money market futures are now pricing in about a 70 percent chance of a rate hike in March, compared to about a 30 percent or less at the start of week. Comments from Fed officials suggested they are worried about rising inflation, as Trump has promised to deliver big stimulus even as the economy is steadily expanding. Markets will scrutinise Trump's address at 0200 GMT for specifics of how the Republican president aims to fulfil his promises to tackle tax reform, boost infrastructure spending and simplify regulations he says are harming business. However, investors are wary that Trump may disappoint those seeking greater detail on how he will reform the tax code as he focuses on domestic issues. "There are two key factors investors will look out for in Trump's speech: fiscal stimulus and tax reform," said Koji Fukaya, President at FPG Securities in Tokyo. "The dollar would strengthen if Trump mentions both in detail. If he touches only the tax reform, the range would stay the same. The markets would be disappointed if he does not elaborate on either of the agendas, and the dollar could weaken below 111 yen," said Fukaya. The dollar rallied to a 14-year high soon after Trump won the U.S. election last November, buoyed by hopes he would introduce large fiscal stimulus and reflationary plans. However, the greenback sagged in January in the absence of specifics on tax reform. U.S. economic data released on Tuesday showed a moderate growth path under the Trump administration, as the U.S. economy expanded at a slower pace in the fourth quarter, in line with last month's estimate.